At Moorddrift, some 13 kms south of the central Limpopo town of Mokopane, the Nyl River is wide and shallow, with low sandy banks, an ideal crossing point for the migrating herds of animals of the past, or for long lines of barefooted African traders bearing heavy loads on their heads, or for the oxwagons of the Trekkers moving north in their quest to find a homeland somewhere in the African hinterland where they could live an independent existence, far from British Rule. It was the “Jerusalemgangers” – a Trekker religious sect intent on reaching the Holy Land – that named the river thus, for it was the first river they had encountered that followed a northwards course. They thought, optimistically, that they had at last encountered the headwaters of the Nile in their trek northwards. The Tswana had another more appropriate name for it: they called it the Mogalakwena – “Mother of Crocodiles”, and the river crossing was known as Esikweni Sengwenyama, the “forest of the Lions”. The story of the murders at Moorddrift and the subsequent siege at the cave of Gwaša belongs to a longer story of unrest in the northern parts of Limpopo as a growing Boer presence impacted on local groups of Sotho and Ndebele living there. The first white person to penetrate this far north was the notorious frontiersman Coenraad de Buys (originally spelt de Bus), with his fabled harem. One of his several indigenous wives was the sister of Mzilikazi. The founding father of “the Buys People”, his numerous family members eventually settled on the southern flank of the western end of the Zoutpansberg, the settlement coming to be known as Buysdorp. Then came the Trekkers: Johannes Janse van Rensburg – “Lang Hans” – and Louis Trichardt in 1836, with Commandant Andries Hendrik Potgieter hard on their heels. The Trichardt party quarreled with the van Rensburg party over essential supplies such as ammunition and lead which the latter kept borrowing without returning. The short supply of ammunition was soon to prove fatal to the van Rensburg party who decided to push on independently of the Trichardts in an attempt to reach the east coast where they had the possibility of resupply. However, shortly afterwards, in June 1836, the van Rensburg trek was murdered by a raiding party under the Zulu leader, Sakana or Manukosi. The only survivors of the disaster were the children of Frederik van Wyk (the son-in-law of Lang Hans), a six-year-old boy and a three-year old girl, who were taken to live at Sakana’s kraal. It is probable that they died there of malaria. The Trichardt party, after suffering a terrible journey, reached Lourenço Marques (Maputo) on 13 April 1838, only to be decimated by malaria. Commandant Andries Hendrik Potgieter (also known as Hendrik Potgieter) ,however, settled on the south side of the Zoutpansberg, naming the town he founded in this pleasantly wooded area Zoutpansbergdorp – which was later renamed Schoemansdal. The road to his supply line in the south lay through the Makapanspoort, the latter so named because Chief Mokopane’s headquarters, Chidi, was nearby. The trekker highway therefore passed through the territory of Chief Mokopane of the Kekana Ndebele, and crossed the river at Esikwini Sengwenyama. This did not please Mokopane, who was even more perturbed when in 1850, permanent settlement in the Makapanspoort, on the site of the future Potgietersrus, began. Commandant Potgieter had plans to formalize the Makapanspoort settlement by proclaiming a town, and chose the name Vredenburg for it to celebrate his recent reconciliation with his arch-rival Marthinus Wessel Pretorius. However, in December 1852, before he could carry out his intention, he died in Zoutpansbergdorp. His 30-year-old son, Pieter Johannes, took over the reins of leadership and later carried out his father’s wish with regard to proclaiming the town. But trouble was brewing. Hermanus Potgieter, a younger brother of the old Commandant, had an unappeasable predilection for the livestock, land and labour of the local people. Even amongst his countrymen he had a reputation for rough behaviour and for being a troublemaker. In this very remote frontier region there was little to curb excesses of behaviour and Hermanus Potgieter’s methods to secure what he wanted were chillingly ruthless. He was notorious for demanding tributes of cattle, and more importantly, of children, who were forced into indentured labour under the ingeboekt system, in effect a form of slavery. In 1853, the famous trader João Albisini who ran the safari trade from the Zoutpansberg to the Portuguese port at Delagoa Bay, warned the Boers of incipient hostilities. Messages of mutilation on Boer subjects and livestock were being sent out by the Ndebele rulers. The last straw came in August 1854 when Hermanus Potgieter shot and killed the brother of Mokopane over a dispute concerning a buffalo that had been shot. The two Ndebele allies decided that enough was enough. A month later, in September, twenty-eight Boers were killed in three separate incidents by the two chiefs. There are multiple versions of these stories, both in the form of varied oral traditions of the Kekana people, and in the recorded and often conflicting testimonies of Trekker history. Mankopane avenged the death of Mokopane’s brother by luring Hermanus Potgieter into his kraal at Fothane with tales of ivory. Once there, he and his support party were tempted away from the wagons by bearers carrying great tusks of ivory. They were caught unaware and killed. Potgieter was flayed alive. Eight persons were also murdered at Fothane – “moordkoppie”. The other two murders were carried out near Mokopane’s capital in the Makapanspoort. The first was at the river crossing at Esikgweni Sengwenyama. Here, a Boer party camped under the camelthorn trees next to the drift were set upon and murdered, the heads of six children being dashed to pieces against the boles of the trees. Twelve persons were murdered here by Mokopane, and their corpses mutilated in different ways. In subsequent years it was to acquire the name Moorddrift. The third incident involved a smaller party that had gone to trade at the chief’s village at Chidi, on the present-day farms of Pruizen and Twenty Four Rivers just south-east of the newly proclaimed trekker town of Vredenburg. They too were murdered. All the murders were characterized by gory mutilation and brutality, the Ndebele hoping in this way to scare the Boers from territory they deemed to be their own. Such acts did not go unnoticed, and a commando led by Piet Potgieter, nephew of Hermanus, and M W Pretorius was mounted against Mokopane, even though it had been Mankopane (Mapela) who had killed Hermanus Potgieter. 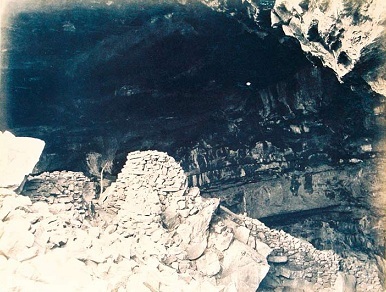 Mokopane and his people had retired to a massive cave in the mountains, some 23 km north-east of Vredenburg. This cave has the local name of Gwaša, which refers to whisperings, breaths or sighs – the “breath” of the cave is said to be foetid with disease. The Boer name for the cave was, of course, Makapansgat, from which the farm on which the historic cave is situated takes its name. Makapansgat was declared a World Heritage Site in 2005 on account of its rich and multi-layered heritage extending in an almost unbroken record from Ape-man times about three million years ago to the present. The cave of Gwaša, also known as Makapan’s Cave or Makapansgat, is situated on the side of a hill in a narrow valley, in which there occur a number of caves. Gwaša has two entrances, and the Kekana Ndebele tried to fortify them by partially walling them off with stone and by creating breastworks inside the cave. Sadly, being perched high above the valley bottom, the caves have little or no water, which made the choice of the retreat a disaster. The commando of M W Pretorius and Piet Potgieter caught up with the fugitives on 25 October 1854 and laid siege to the cave. It was blockaded and two small field cannon were dragged up the opposite flank of the valley and attempts were made to fire into the wide mouth of the refuge. Kekana, firing from behind the redoubts they had constructed inside the cave, made it too hazardous to storm. Other tactics were tried. A plan to collapse the roof of the cave by setting off explosive charges was adopted. However, the first experiment failed and gunpowder was too expensive and scarce to allow a repeat attempt. Huge piles of firewood were thrown off the cliffs above the cave and set alight in the hopes that billows of smoke would be drawn into the cave and so smoke the fugitives out. Attempts to escape under cover of darkness were discouraged by the deadly accuracy of fire of the night patrol – which claimed the lives of more than 700 victims. After this more and more women and children gave themselves up. On 6 November, Piet Potgieter was standing at the edge of the cliff and peering over to see what was going on below, his body probably clearly silhouetted against the sky. From the darkness within, a Ndebele sniper took aim and his bullet found its mark. Piet Potgieter died where he fell, at the mouth of the cave. His body was retrieved by a young Field-cornet Paul Kruger, with the help of João Albisini’s headman, Manungu. By the time 17 November 1854 came, resistance had collapsed and parties of Boers began entering the cave and on the 21st the siege was called off. A strong consideration in calling it off was the threat of horse sickness which comes on with the onset of the summer rains, and the Boers would have been left vulnerable without their horses. It will never be known how many Kekana died in the siege. Military reports state figures in excess of 2 000. However, the adage that the first casualty of war is the truth is particularly true of casualty figures. The figure of 2 000 would have left a large number of corpses inside the cave. In fact, further exploration of the cave immediately after the siege was discouraged by the almost unbearable stench of decomposing bodies. The site should be seen as a mass grave. But what happened to all the bones is still a mystery. Photographs taken by itinerant Swiss photographer H R Gros in 1883, almost 30 years later show numbers of skulls which he used as photographic props. One consequence of the siege was the commemorative re-naming of the rather inappropriately-named town of Vredenburg (town of peace) to Piet Potgietersrust, later shortened to Potgietersrus. Still more recently, it was renamed Mokopane in commemoration of the chief whose tribe was almost destroyed in the cave.